House of mirrors? Every variety of tablet/laptop combination imaginable showed up – inside the Asus booth at Computex, staggering choice, but a couple of standouts that hint at what musicians might actually want to use. What if your computer could do what tablets do – without having to kludge together multiple devices? That question probably doesn’t keep ordinary people up at night. But with music makers unusually ravenous users of touch software, they might just be at the vanguard of new convergences of creative computing. Picture this scenario. Your computer behaves the way it always has – with the usual complement of software and the same comfortable form factor and editing tools. You have the precision of the keyboard and pointer. Then, when you need it, that computer can also be a tablet. You pick up a soft synth and use your fingers to draw sounds, then strum a virtual keyboard or fretboard to assemble melodies. You set up your notation software next to your instrument and tap in notes as you write a song. Or you go onstage to play or DJ. Rather than hunching over the screen squinting at the UI, or hiding the machine in a corner, you instead have a fat-finger-friendly mixer or performance layout you can easily play alongside physical instruments and controllers. But what you don’t have to do in this story is switch between the tablet and laptop. That means you don’t have to worry about buggy wireless connections or whether you’ve synced files when connecting the two. It means you don’t have the dawbacks of tablets – running out of horsepower, not getting to run software you rely on, or running out of ports for hardware you need. But it does mean you could get touch on your conventional laptop. And it means you’re not buying – and carrying around – two pieces of hardware that do essentially the same job. Not everyone needs or wants this kind of convergence. But for those who have felt left out by the divide between laptops and tablets, it seems a logical solution. 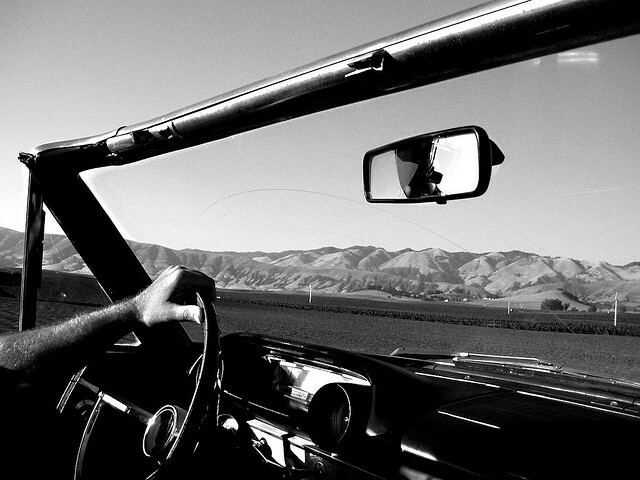 Convertibles: the Way to Go? Best way to drive: convertible. By which, of course, we mean laptops that mutate into tablets. Photo (CC-BY) emdot. Just adding touch to the display doesn’t really work; in fact, it amplifies the problem. It puts your hands and arms in an uncomfortable position – that same hinge that worked so well for keep the screen handy while typing is now a detriment. That’s why it seems convertibles – form factors that transform between laptop and tablet – seem to hold the most promise. Windows software would need to be updated to take advantage of touch capabilities, since widgets like knobs are all sized for the mouse and designed to respond to only one pointer at a time. Having seen the landscape of the PC market, and the strategic direction taken by Intel and Microsoft, this time seems different. 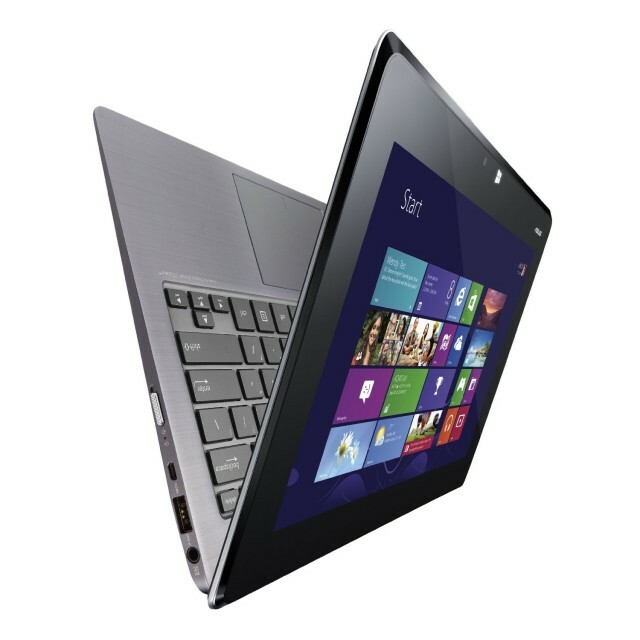 It may actually get hard to buy thin ultrabooks without touch shortly. And Windows 8 is an OS clearly designed to target touch as a core feature. The leading machines, the ones you can’t keep in stock, both support touch; that’s no accident. So, the machines are coming. Whether developers and users invest time in them, though, is still dependent on whether they’re any good. Just forget for a moment early efforts you may have seen. The first convertible tablets were, admittedly, terrible. Some were even based on underpowered netbooks, with the lackluster performance to match. Others were thick and heavy. The displays were poor. The touch on the screen often had only basic support for even two-fingered multi-touch. Touch was inaccurate, laggy, buggy, required extra finger pressure – or all of these. Getting a laptop that’s both worse and costs more is clearly not a recipe for success. Times have changed. PC makers still take a “kitchen sink” approach, trying endless strange varieties to see what sticks. But some things actually are sticking. Lenovo led the industry in growth at the end of last year, particularly in the United States, driven in part by the success of its Yoga ultrabook. Fold the hinge of the Yoga, and keep folding, and keep folding, and like a contortionist, the laptop’s display folds all the way to turn it into a tablet. As a first-generation device, some details on the Yoga weren’t quite right; the Yoga lacked some of the nicer performance and hardware design features of its brethren. But 2013 is likely to be the first year we see a mature generation of convertibles, paired with Windows 8 (make that 8.1). Could a survivor emerge from all these evolutionary oddities? That’s the question I began to answer in Taipei earlier this month, during the Computex show. Night market, Taipei. Here, the tyranny of choice bothers no one – myself included. I’m now wandering from food vendor to food vendor, studying menus that are entirely indecipherable. 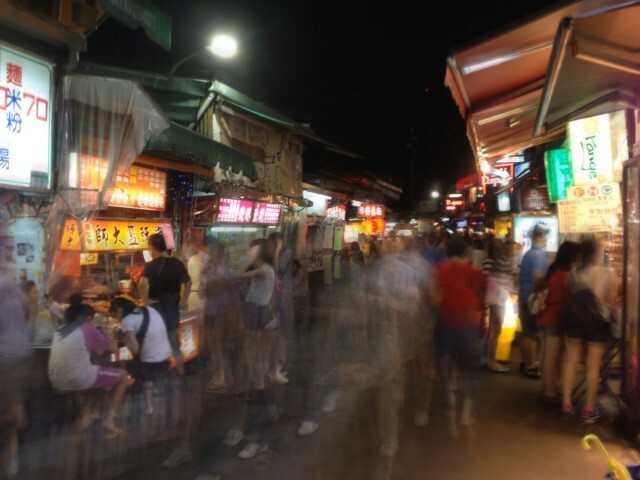 Go shopping for anything in Taipei – electronics or street food – and you’re aware that you’re in an environment were techno-maximalism and the tyranny of choice frighten no one. In a place where something as simple as a fruit tea or an ice cream is accompanied by endless menus, it’s perhaps not surprising that computer vendors would happily saturate retailers with numerous variation. In the end, buying the street food was easy – I had some friends as guides, and I chose things that looked tasty, and ate things that smelled smelly to find some stuff that was delicious. I’m not sure the computer side of things is nearly as easy. And here, the comparison fits: it would not be in all way strange to imagine a night market full of convertible tablet/laptop contraptions, unsure of which is usable. 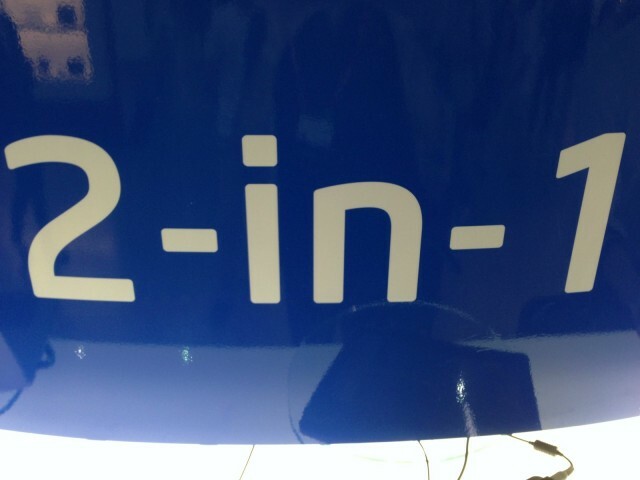 Two in one was Intel’s watchcry at Computex, and they had a round-up of machines to show off. The problem was, more in this case wasn’t necessarily more. There are other problems with Windows RT, too. The good news is, audio latency has been vastly improved, and we’re seeing an OS that, in theory, at least, supports the kind of low-latency operation we’ve had for years on Windows desktops. But just as we saw earlier this week with Android, Windows RT applications are unable to handle MIDI hardware. That means ARM Windows RT tablets are completely left out and any “Metro-style” modern Windows app in the Windows Store is shut out, too. MIDI is, perhaps, an arcane format to ask Microsoft to support. But on the other hand, it’s an extremely simple API to support. Compare the cost of, say, hiring the world’s richest DJ to promote your product – you could just add these weird MIDI features and let the musicians come to you. Ahem. And we’re not just talking about connecting your Windows tablet to your Jupiter 8 (though, hey, some of us love MIDI on synths). We’re also talking about critical input devices almost all musicians use at one point or another. Anyway, the good news from Computex is a lot of PC makers are going great guns on conventional Windows. Add up countless other markets with their own weird application and hardware requirements, and you have, well, the PC market that has propelled Microsoft and PC OEMs all these years. It’s easier to make a case for Windows with touch here against things like the iPad, because you get a no-compromise OS that does everything. Over and over again, the three makers that for me stood out were Acer, Asus, and Lenovo, in build quality and smart design. 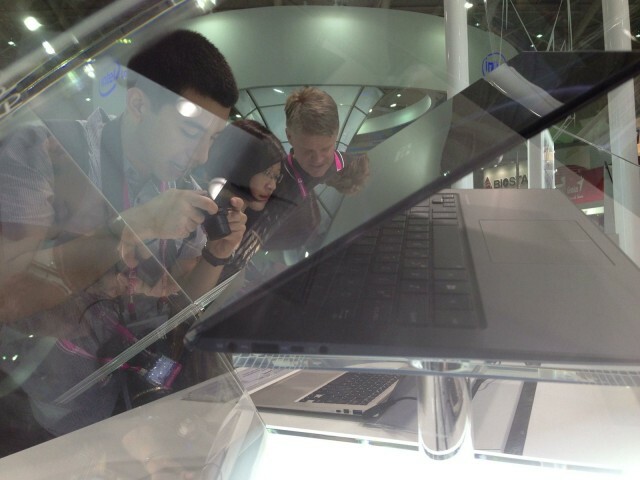 A tour around the Asus booth was downright dizzying. A rep for the company showed me the baffling 3-in-1 Transformer Book Trio, for example. It’s a Windows notebook, but then you detach it and it’s an Android tablet (stay with me), but then there’s a dock that turns it into a desktop, but then your kid might use it to play Angry Birds on Android again, but then you can plug it into a TV, and… augh. Trust me: if there’s an idea you could try, theoretically, some PC maker is trying it. I think this image more or less sums up how confusing the Asus Transformer Book Trio is. Keep looking at that picture. 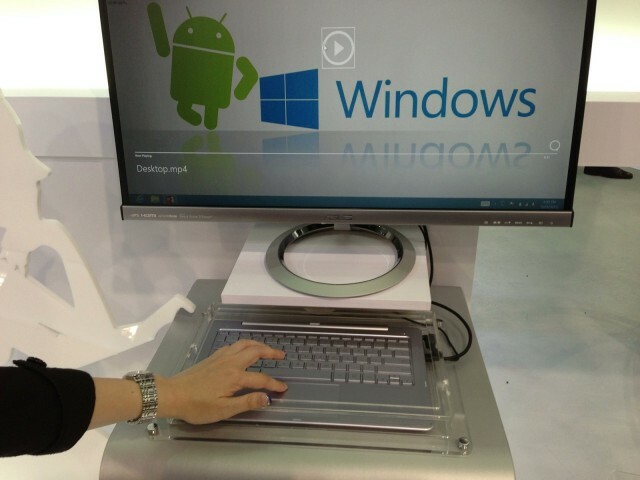 Yes, that’s a keyboard that’s a dock hooked up to a TV and an Android logo dancing around with Windows 8… whoa. Asus also had one of the best ideas I’ve seen to counter the Yoga, though. Dubbed, hilariously, the TAICHI, it one-ups Lenovo by skipping the hinge and simply building a second display into the lid of the laptop. So, open the laptop, and it’s a conventional machine. Then close the laptop, and the lid becomes a touchscreen. Instead of more hinge tricks, Asus just added another touchscreen display on the lid. Surprisingly, the results are slim and light and testing it hands-on, the display is good. Shame about the 4G memory limit, though. Cough. Image courtesy Asus. The TAICHI for now has at least a reasonable processor (i5/i7), though it’s hampered by a 4GB memory limit. I await the Tae Bo and Pilates, and then this competition will really be on. Some time on the trip back from Taiwan – maybe it was while I was comfortably using my (cough) iPad – it occurred to me that I hadn’t actually seen any laptop I’d want to bring back with me. So, my optimism may sound strange here. But I think the PC market is this sort of grand experiment in evolution. This is a market that acts like a whole ecosystem, that learns from its failures. Those of us who have been in it for a long time remember this cycle from many years ago. What ought to be significant to music developers at the moment is this: touch is coming on everything. And partly because the market has been lukewarm on Windows RT, it’s coming to machines that run “real” Windows. That means when Propellerhead releases Thor for iPad, they might consider how usable Reason is on one of these laptops. When Ableton sees its customers using lots of tablets as remote controls for Live, they might try using it with their fingers – and those “remote control” apps might think about running on Windows and not just iOS. When Native Instruments adds new ways of manipulating waveforms to Traktor on iOS, they should wonder why they can’t do the same thing on Windows laptops that now work with fingers and not only mice or trackpads. I hope to get hands on one of these machines so we can try some of these features; maybe we have a little simple test app that people can try out on all these computers. Anyone interested, do get in touch. I look forward to the days of replacing “dude, were you checking your email?” with “dude, why were you massaging the lid of your laptop?” in live sets. ¡Viva la Revolución!